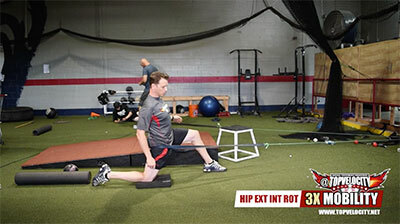 This course will cover 3X Mobility Training to develop the High Velocity Pitcher. Most high velocity pitchers have elite level joint mobility which allows them the ability to get in the position to use the entire body or kinetic chain to generate 90+mph pitching velocity. Many of these pitchers genetically have this joint mobility but with the new science of today we have discover the process of unlocking these joints. This course was built for those pitchers who do not have the genetic joint mobility profile of a high velocity pitcher and want the ability to develop it. You will first learn what ranges all of the joints must be able to accomplish and then you will be given a full list of exercises to improve them. Once you have these ranges recorded you compare them to the joint mobility ranges of the high velocity pitcher to learn where you need to make improvements. You will then follow the list of exercises in the follow videos to improve these ranges. Once the routine is establish about 30 minutes to an hour a day then the process is to repeat measuring to see what joints are improving and what joints are not to shift focus into another cycle of training. This process over time will develop the joint ranges of the high velocity pitcher. Gain a cutting edge on this game before anyone else does and start this 3X Pitching Mobility Course TODAY! Want to develop the mobility of a high velocity pitcher? Start this course today!